A new study based on data from the Cassini mission is revealing something surprising in the atmosphere of Saturn. We’ve known about the storm at the gas giant’s north pole for decades, but now it appears that this massive hexagonal storm could be a towering behemoth hundreds of kilometers in height that has its base deep in Saturn’s atmosphere. This grey-scale image of Saturn’s northern polar vortex was captured by the Cassini spacecraft. This image was captured from a distance of about 1.2 million km. A portion of Saturn’s rings are barely visible in the top right. Image: NASA/JPL-Caltech/Space Science Institute. The Cassini spacecraft is nearing the end of its lifespan. This September, after spending the past twenty years in space – twelve and a half of which were dedicated to studying Saturn and its system of moons – the probe will be crash into Saturn’s atmosphere. But between now and then, the probe will be making its “Grand Finale” – the final phase of its mission where it will dive between the planet and its rings 22 times. In addition to exploring this region of Saturn (something no other mission has done), the probe will also be using this opportunity to study Saturn’s hexagonal polar jet stream in greater detail. This persistent storm, which rages around Saturn’s northern polar region, has been a subject of interest for decades. And now that it enjoys full sunlight, Cassini will be able to directly image it with every pass it makes over Saturn’s north pole. This persistent storm was first noticed in images sent back by the Voyager 1 and 2 missions, which flew by Saturn in 1980 and 1981, respectively. As storms go, it is extremely massive, with each side measuring about 13,800 km (8,600 mi) in length – longer than the diameter of the Earth. It also rotates with a period of 10 hours 39 minutes and 24 seconds, which is assumed to be equal to the rotation of Saturn’s interior. When the Cassini spacecraft arrived around Saturn in 2004 to conduct the first part of its mission, this region was in shadow. This was due to the fact that the northern hemisphere was still coming out of winter, and was hence tilted away from the Sun. However, since Saturn began its summer solstice in May of 2017, the northern polar region is now fully illuminated – at least by Saturn’s standards. In truth, between its distance from the Sun (an average of 9.5549 AU) and its axial tilt (26.73°), the northern polar region only gets about 1% as much sunlight as Earth does. And from the perspective of the north pole, the Sun is very low in the sky. Nevertheless, the sunlight falling on the north pole at this point is enough to allow the Cassini mission to directly image the region by capturing its reflected light. Images of the hexagonal jet stream (like the one above) will be taken by Cassini’s wide-angle camera, which uses special filters that admit wavelengths of near-infrared light. Already, Cassini has captured some impressive imagery during its first plunge between Saturn and its rings (which took place on April 26th, 2017). The rapid-fire images acquired by one of Cassini’s cameras were then stitched together to create a movie (posted below). As you can see, the movie begins with a view of the vortex at the center of the hexagon, then heads past the outer boundary of the jet stream and continues further southward. Toward the end of the movie, the spacecraft reorients itself to direct its saucer-shaped antenna in the direction of the spacecraft’s motion, which is apparent from the way the camera frame rotates. The images that make up this movie were captured as the Cassini spacecraft dropped in altitude from 72,400 to 6,700 km (45,000 to 4,200 miles) above Saturn’s cloud tops. As this happened, the features which the camera could resolve changed drastically – going from 8.7 km (5.4 mi) per pixel to 810 meters (0.5 mi) per pixel. The movie was produced by Kunio Sayanagi and John Blalock – an associate of the Cassini imaging team and a graduate research assistant (respectively) at Hampton University in Virginia – who collaborated with the Cassini imaging team. And thanks to this video, new insights are already being made into the hexagonal jet stream and the mechanisms that power it. Between now and the end of the mission, who knows what we might learn about this mysterious storm? The next plunge – aka. Grand Finale Dive No. 4 – will take place on Sunday, May 15th at 4:42 p.m. UTC (12:42 p.m EDT; 9:42 a.m. PDT). A total of 22 dives will be made on a weekly basis before the probe takes the final plunge – the one that will cause it to breakup in Saturn’s atmosphere – on Friday, September 15th, 2017. The Cassini spacecraft has done some amazing things since it arrived in the Saturn system in 2004. In addition to providing valuable information on the gas giant and its system of rings, it has also provided us with extensive data and photographs of Saturn’s many moons. Nowhere has this been more apparent than with Saturn’s largest moon, the hydrocarbon-rich satellite known as Titan. And with just a few hours left before Cassini makes its final plunge between Saturn and its innermost ring (something that no other spacecraft has ever done), we should all take this opportunity to say goodbye to Titan. In the past few years, it has dazzled us with its methane lakes, dense atmosphere, and potential for hosting life. And it shall be sorely missed! Cassini’s last encounter with Titan – where it passed within 979 km (608 mi) of the moon’s surface – took place on April 21st, at 11:08 p.m. PDT (April 22nd, 2:08 a.m. EDT). The probe also used this opportunity to take some radar images of the moon’s northern polar region. While this area has been photographed before, this was the first time that radar images were acquired. Over the course of the next week, Cassini’s radar team hopes to pour over theses images, which provide a detailed look at the methane seas and lakes in the northern polar region. It is hoped that this data will allow scientists to shed more light on the depths and compositions of some of the small lakes in the area, as well as provide more information on the evolving surface feature known as “magic island“. With this last pass complete (its 127th in total), Cassini is now beginning the final phase of its mission – known as the Grand Finale. This will consist of the spacecraft making a final set of 22 orbits around the ringed planet between April 26th and September 15th. The maneuver will allow Cassini to go where no other probe has gone before and get the closest look ever at Saturn’s outer rings. Cassini’s final pass with Titan allowed it to acquire a boost in velocity, increasing its speed by 860.5 meters per second (3098 km/h; 1,925 mph). It then reached its farthest point in its orbit around Saturn (apoapse) on April 22nd, :46 p.m. PDT (11:46 p.m. EDT). This effectively began the Grand Finale orbits, with the first dive coming on April 26th, at 02:00 a.m. PDT (05:00 a.m. EDT). This orbit will provide Cassini with its best look to date at Saturn’s north pole, which it will be studying with both its Visible and Infrared Mapping Spectrometer (VIMS) and Composite Infrared Spectrometer (CIRS). 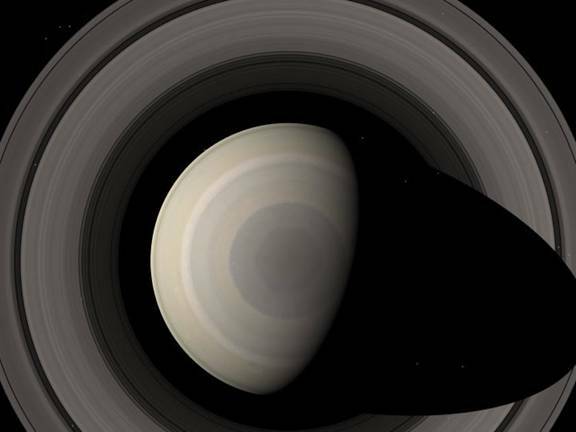 These studies will lead to the creation of the sharpest movies to date in the near-infrared band, which will also allow the science team to study the motions of the hexagon pattern around Saturn’s north pole in more detail. Between now and September, when the mission will end, the probe will provide information that is expected to improve our understanding of how giant planets form and evolve. Things will finally wrap on September 15th, 2017, when the probe will plunge into Saturn’s atmosphere. But even then, the probe will be sending back information until its very last seconds of operation. Safe journeys Cassini! And so long Titan! We hope to be exploring you again someday soon, preferably with something that can float or fly around inside your dense atmosphere, or perhaps investigate your methane seas in serious depth! Welcome back to our planetary weather series! Next up, we take a look at the ringed-beauty, Saturn! Saturn is famous for many things. Aside from its ring system, which are the most visible and beautiful of any gas giant, it is also known for its extensive system of moons (the second largest in the Solar System behind Jupiter). And then there its banded appearance and gold color, which are the result of its peculiar composition and persistent weather patterns. Much like Jupiter, Saturn’s weather systems are known for being particularly extreme, giving rise to features that can be seen from great distances. It’s high winds periodically create massive oval-shaped storms, jet streams, hurricanes, and hexagonal wave patterns that are visible in both the northern and southern polar regions. The presence of hydrogen gas results in clouds of deep red. However, these are obscured by clouds of ammonia, which are closer to the outer edge of the atmosphere and cover the entire planet. The exposure of this ammonia to the Sun’s ultraviolet radiation causes it to appear white. Combined with its deeper red clouds, this results in the planet having a pale gold color. The winds on Saturn are the second fastest among the Solar System’s planets, after Neptune’s. This is due in part to Saturn’s high rotational velocity – which is 9.87 km/s (6.13 mi/s), which works out to 35,500 km/h (22,058.7 mi/h). At this rate, it only takes the planet 10 hours 33 minutes to rotate once on its axis. However, due to it being a gas giant, there is a difference between the rotation of its atmosphere and its core. Data obtained by the Voyager 1 and 2 missions indicated peak easterly winds of 500 m/s (1800 km/h). 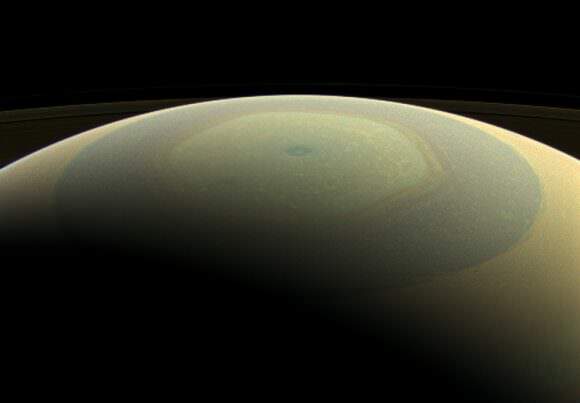 Saturn’s northern and southern poles have also shown evidence of stormy weather. At the north pole, this takes the form of a hexagonal wave pattern, whereas the south shows evidence of a massive jet stream. The south pole vortex, meanwhile, was first observed using the Hubble Space Telescope. These images indicated the presence of a jet stream, but not a hexagonal standing wave. These storms are estimated to be generating winds of 550 km/h, are comparable in size to Earth, and believed to have been going on for billions of years. In 2006, the Cassini space probe observed a hurricane-like storm that had a clearly defined eye. Such storms had not been observed on any planet other than Earth – even on Jupiter. This storm appeared to be caused by heat that was generated in the depths of the warm interior of Saturn, which then escaped to the upper atmosphere and escaped the planet. Saturn has also been noted for its “string of pearls” feature, which was captured by Cassini’s visual and infrared mapping spectrometer in 2006. This feature, which appeared in it’s northern latitudes (and has not been seen on any other gas giant) is a series of cloud clearings spaced at regular intervals that show how Saturn’s atmosphere is lit by its own internal, thermal glow. So how is the weather on Saturn? Pretty violent and stormy! And not surprising given the planet’s mass, composition, powerful gravity, and rapid rotation. Makes you feel happy we live on Earth, where the Earth is (comparatively speaking) pretty calm and boring! We have written many interesting articles about planetary weather here at Universe Today. Here’s What’s the Weather Like on Mercury?, What’s the Weather Like on Venus?, What’s the Weather Like on Mars?, What’s the Weather Like on Jupiter?, What is the Weather Like on Uranus? and What is the Weather Like on Neptune? For more information, check out NASA’s Solar System Exploration – Saturn, and the facts about Saturn from Space Facts. Astronomy Cast has recorded some interesting episode on the subject. Here’s Episode 59: Saturn, and Episode 61: Saturn’s Moons. Ever since the Voyager 2 made its historic flyby of Saturn, astronomers have been aware of the persistent hexagonal storm around the gas giant’s north pole. This a six-sided jetstream has been a constant source of fascination, due to its sheer size and immense power. Measuring some 13,800 km (8,600 mi) across, this weather system is greater in size than planet Earth. And thanks to the latest data to be provided by the Cassini space probe, which entered orbit around Saturn in 2009, it seems that this storm is even stranger than previously thought. Based on images snapped between 2012 and 2016, the storm appears to have undergone a change in color, from a bluish haze to a golden-brown hue. The reasons for this change remain something of a mystery, but scientists theorize that it may be the result of seasonal changes due to the approaching summer solstice (which will take place in May of 2017). Specifically, they believe that the change is being driven by an increase in the production of photochemical hazes in the atmosphere, which is due to increased exposure to sunlight. This reasoning is based in part on past observations of seasonal change on Saturn. Like Earth, Saturn experiences seasons because its axis is tilted relative to its orbital plane (26.73°). But since its orbital period is almost 30 years, these seasons last for seven years. 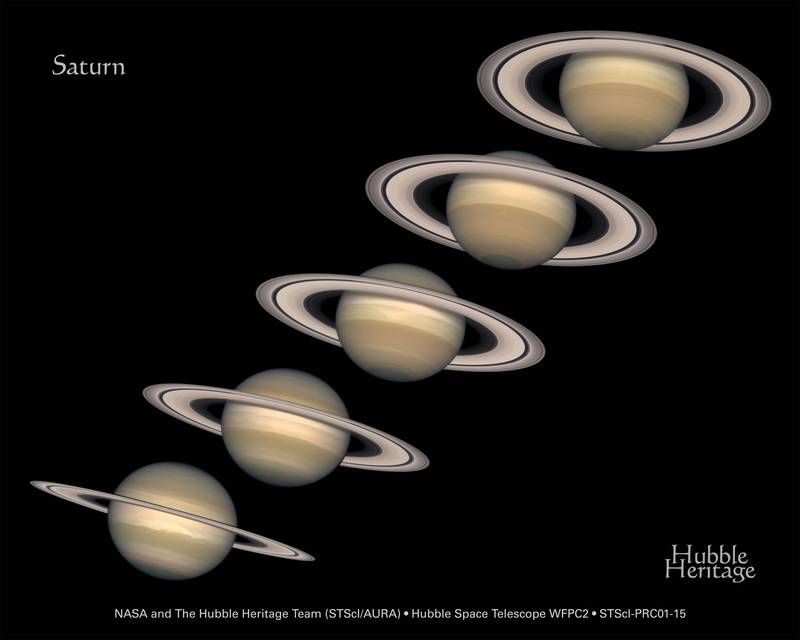 Between November 1995 and August 2009, the hexagonal storm also underwent some serious changes, which coincided with Saturn going from its Autumnal to its Spring Equinox. During this period, the north polar atmosphere became clear of aerosols produced by photochemical reactions, which was also attributed to the fact that the northern polar region was receiving less in the way of sunlight. All of this has helped scientists to test theoretical models of Saturn’s atmosphere. In the past, it has been speculated that this six-sided storm acts as a barrier that prevents outside haze particles from entering. The previous differences in color – the planet’s atmosphere being golden while the polar storm was darker and bluish – certainly seemed to bear this out. The fact that it is now changing color and starting to look more like the rest of the atmosphere could mean that the chemical composition of the polar region is now changing and becoming more like the rest of the planet. Other effects, which include changes in atmospheric circulation (which are in turn the result of seasonally shifting solar heating patterns) might also be influencing the winds in the polar regions. Needless to say, the giant planets of the Solar System have always been a source of fascination for scientists and astronomers. And if these latest images are any indication, it is that we still have much to learn about the dynamics of their atmospheres. It also shows that Cassini, which has been in operation since 1997, is still able to provide new insights into Saturn and its system of moons. In recent weeks, this included information about seasonal variations on Titan, Saturn’s largest moon. By April 22nd, 2017, the probe will commence its final 22 orbits of Saturn. Barring any mission extensions, it is scheduled enter into Saturn’s atmosphere (thus ending its mission) on Sept. 15th, 2017.